Set down your drink in style with a personalized coaster from Etchey! Our personalized bamboo coasters are engraved with precision on a premium top quality bamboo. Our custom coasters are the perfect gift for both family and friends. 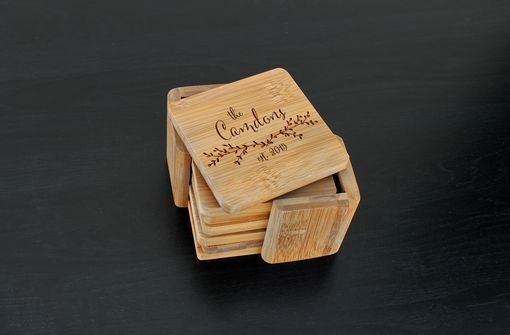 These personalized coasters are also excellent gifts for weddings, anniversaries, and housewarmings. -->Enter the text that you would like to have appear on your product in the "What Would You Like Engraved" box. The font in the image displayed is what will be used for your order. If you choose to use a different font, please tell us in the "Engraving" box. At Etchey, we make processing speed a top priority. We know that when you fall in love with a personalized product, you would like to receive it as soon as possible. Once you have placed your order you will receive your free proof via a message through Custom Made. We will continue to work with you until you are 100% satisfied with your proof. Once you let us know that you are happy with your proof we will get busy engraving! If you chose "no, faster processing" when ordering you will not receive a proof and we will get busy working on your order right away.